These plans will show you not only what additional parts you will need to purchase for the larger 3-6 foot plus wild flames, but where to purchase them and how to install them in conjunction with the basic kit. 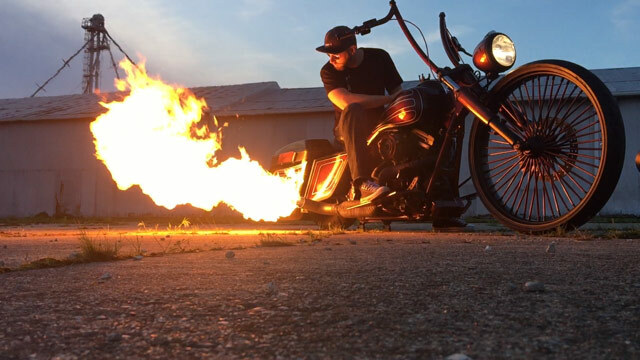 A gasoline injected flame thrower injects fuel from your existing gas tank into the exhaust pipe in order to produce 3-6 foot plus wild flames. This type of flame thrower is not for the meek or the timid. If you want 6-24 inch blowtorch afterburner flames you need just the basic kit. Step by step detailed instructions with a list of all the parts needed to build this type of flame thrower and where to buy them from are included with these plans. Average cost for the additional parts will be about $200. Please contact us to find out more about how well the mega flames will work on your application before purchasing.